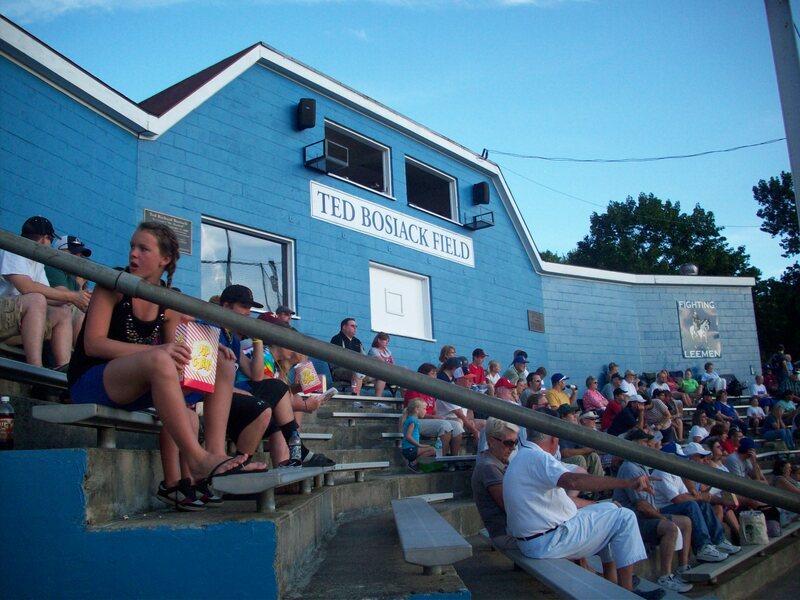 Ballpark Basics: A small park that comes with some unusual features, a lot of regulars and the need for sunglasses. 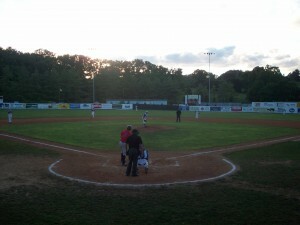 Ballpark Breakdown: The Valley League is a collegiate summer league that has been around since 1923. It got the name since the majority of the teams are in the Shenandoah Valley between the Blue Ridge Mountains on the east and the Allegheny Mountains to the west. 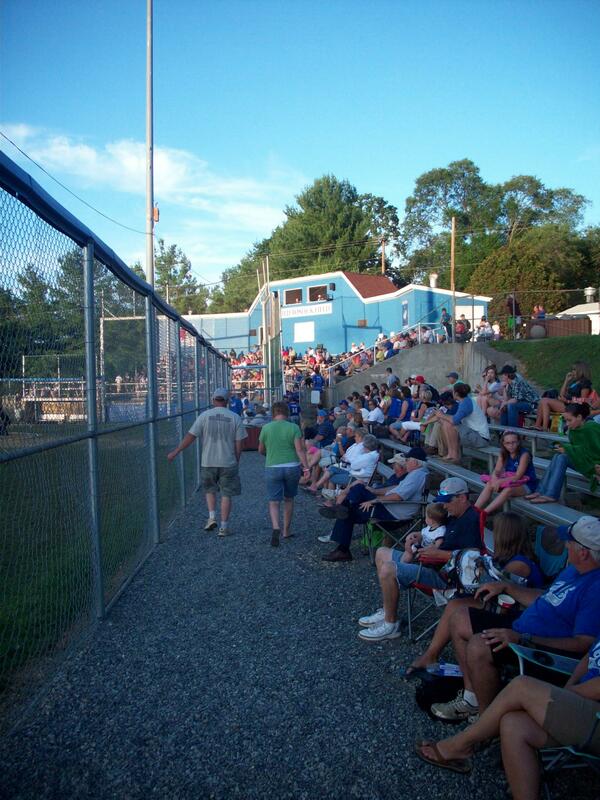 Many of the teams share their fields with some of the local schools and The Staunton Braves are no exception. They share their field with the Robert E. Lee High School team. The field is actually a part of the city’s sports complex so there is a football field as well as tennis courts and even a skate park. However, there are some quirks that make it a little more interesting than many of the other fields in the Valley League. The press box is a cinder block building that stands over the small cement grandstand with metal bleacher seating. The grandstand is sloped off on top of each team’s tiny dugout. People used this space to set up chairs and it looked like these were the hot seats to get. It actually gave you a great vantage point for the game. However there was only room for about five chairs and it looked like these spots filled up quickly by the locals. Ironically many people chose not to sit behind home plate since the sun sets directly in center field. This made for an interesting game as batters tried to see the pitch as they stared almost directly into the sun. Once the sun went down it wasn’t a problem but with a 7 pm start in the middle of July, it made for an interesting first few innings. Instead of netting the field is surrounded by chain-link fencing. Behind home plate they have added extensions which really obstruct the view depending upon where you are sitting. The concourse that runs behind the grandstand is actually a road that is used to transport materials from the school to the football field next to the baseball stadium. We joked that this was the first concourse we have ever seen with speed bumps on it. A small cinderblock shack makes up the Wig Wam where they sell a few pieces of Braves swag. A small concession stand rounds out the offerings at the complex. On top of the grandstand seating there are a set of long bleachers down each baseline. On the night we were there all of the stands were pretty full. This is apparently a regular occurrence as the Braves are typically close to the top in attendance in the Valley League. The town is very supportive of the team and has watched some players move from their summer collegiate league all the way up to the majors including the likes of Aubrey Huff, Luke Scott, Shawn Camp, and Chad Tracey. Brew Basics: An interesting mix of ready made beers and brew your own options, with over 60 recipes to try. We were impressed with the number of different beers they had available – 16 in the glass cases up front, and another 8 or so on tap, but our “host” didn’t take the lead with the tasting, to the point that we felt as though we were imposing asking to sample more than a couple – even though the majority of the beers on tap weren’t even available to purchase out of the coolers. 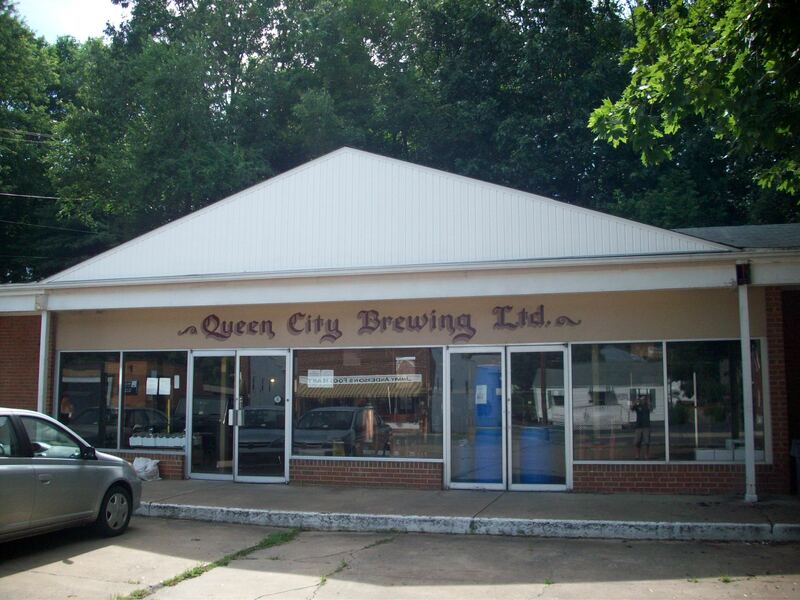 Queen City is set up to allow you to brew your own beer, vint your own wine, or even bottle your own soda if you are so inclined. Beer is definitely the best of the three options, as they let you bring in your own recipe, or peruse a huge binder of their own beers, which they’ll allow you to make, and come back to bottle – 2 cases worth for just under 65 dollars. Upon entering you are immediately in front of beer cases where you can grab some to go, and mix cases or six. 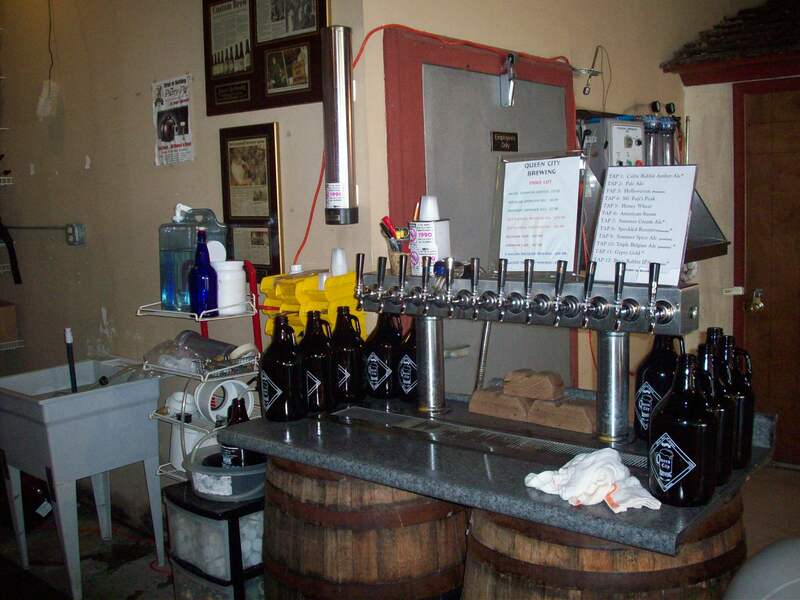 Across from you are some more storage areas, and the “tasting spot” where taps are located and growlers are filled. 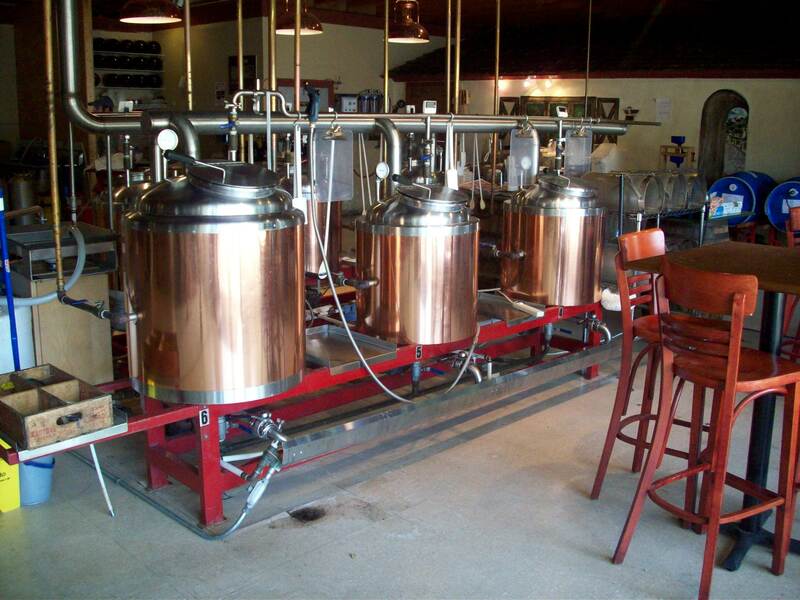 The main part of the room is made up of small brewing tanks and other equipment to facilitate the brew your own aspect of Queen City. There are just a few spots to have a seat, and much of this is moved out of the way when the occasional band comes to perform. Which reminds us…like their logo, Queen City’s website is very outdated, and contains no information on upcoming events or ABV and IBU content. Queen City has chosen not to work with any distributors, and therefore the only place to get it is their tiny building (what used to be a 7-11) in an out of the way corner of Staunton, VA. Growlers and bottles are available for purchase, but keep in mind that you are much more limited with bottles, because the contents of the coolers stay pretty consistent, and the experimental, seasonal and just otherwise “non-standard” beers are only available on tap, and can only be taken home in a growler. As mentioned, they have an extensive beer recipe collection, and have close to 20 available at any given time in store, including their Rabbit Series beers (rabbits = lots of hops. Rabbits, hoppy, get it?) Given our unfortunate rushed and limited tasting experience, we weren’t able to gather enough information about any of the three beers we tried there to post here. We did however, mix a premium 6 (premiums are in the cooler to the right, cost a dollar more per 6-pack, and typically are higher gravity than the standards). Read on for the results! White Rabbit Apricot Ale – This light, sweet beer has an apt name, as both the color and aroma are bring to mind candied fruits. The palate starts out a bit tart, but it quickly gives way to a decent amount of -hops, and then finished –almost too- sweet. It’s also a bit thicker than you’d expect. Dark Rabbit Stout – We had high hopes for this beer, it poured strong smelling and dark with lots of head. 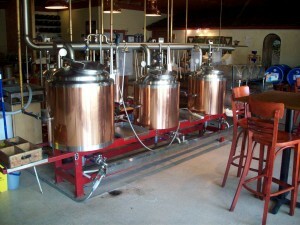 But after a few sips, we began to wonder if we’d had a bad batch. It was gritty and seemed like it was not fully blended. Powerfully sweet at first, then earthy with a bit of anise. Hard to drink. Speckled Rooster Ale – Great aroma, lots of hops and full, long lasting head. The Speckled Rooster is a copper toffee colored beer that’s also very carbonated. Combine that with the thick head, and you get a taste that starts thick and hoppy, has caramel malted noted in the middle and a good, spicy hop aftertaste. Probably our favorite of the ones we tried from Queen City; it’s tingly on the tongue, but remains easily drinkable with a complex craft beer taste. Scottish Ale 80 – smooth with a surprising deep red color and a faint coffee nose with a touch of molasses. It’s got a smooth, strong flavor that is slightly carbonated in the middle and a smooth finish. This one would be good with a steak. Brass Rabbit IPA – This is a pretty beer that is on the brown side of gold with a slight orange hue. It’s not terribly bitter like some IPAs, and has a refreshing floral hoppy smell. The taste is pleasantly hopped, and again the florals come through. What would be a good flavor is at first overpowered by high carbonation, but the muted palate comes back strongly after the sip. Triple Belgian Ale – an Abbey style ale, golden with lots of taste and just the right amount of carbonation. The scent smells of apricots at first, but then gives way to a crisp refreshing aroma. The palate holds true to the bouquet, and is wheaty, slightly woody and equally crisp. Slightly sweet tones that is not cloying or unpleasant. A Refreshing beer on a cool autumn evening. These are just a handful of the many, many beers available at this unique brewery, if you have one to recommend, be sure to let us know!